Use soft chicken (cockerel or rooster) for this. I used onion powder so as not to have pieces of onions on the chicken. YOu can used blended fresh onions. You can add any other fresh seasoning of your choice: onions, garlic etc but grind them very well so the pieces do not stand out. Blend the onion powder, thyme, black pepper and seasoining cubes (crushed) with a dry mill or spice grinder to turn them into fine powder. Clean the chicken, removing all tiny feathers and rinse thoroughly. Place in a bowl and add the blended spices and herbs from step 1 above. Mix very will till everything is well incorporated. Cover the bowl with aluminium foil or thin plastic film and place in the fridge for at least 1 hour to marinate. After one hour, place them in a oven tray and bake in the oven at 200°C or 400F for 30 minutes. While that is baking, peel the mango and chop into small pieces. Deseed the habanero pepper and chop into tiny pieces. Blend the mango and pepper with an immersion blender. When done add the salt to improve the flavour and mix well. 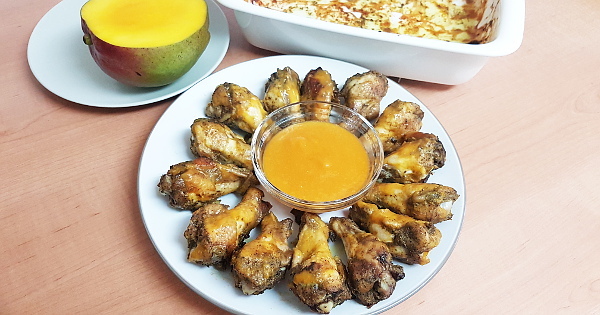 After 30 minutes of baking the chicken, use a brush to rub some of the mango blend all over the chicken, turn them around to ensure every side is coated with the mango blend. Put back in the oven for about 5 minutes and apply another coat. After a total of 10 minutes, it's ok to take it out of the oven. ServeThat's it! Serve with the remaining mango blend as dip. Enjoy it as appetizer or as a snack with a chilled drink.